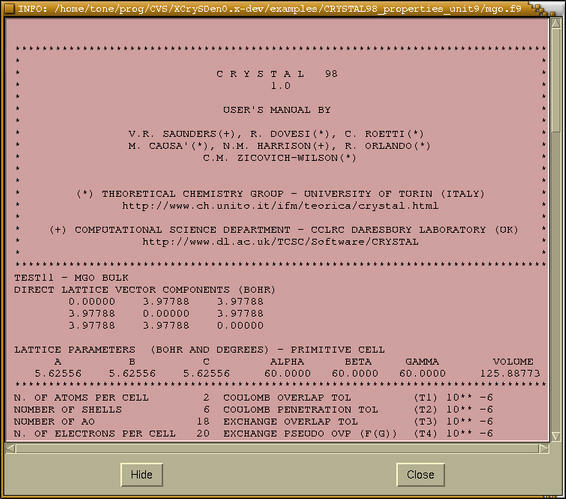 XCrySDen program can be used as a graphical user interface (GUI) for the CRYSTAL-95/98/03/06 program (http://www.crystal.unito.it/). Although XCrySDen's GUI supports only a subset of CRYSTAL options, there is also a possibility of entering CRYSTAL options manually. The advantage of the GUI is its rendering possibility, which yields graphical feedback to the user. Every manipulation of the structure is visualized immediately and to enhance the usefulness of XCrySDen even further, an UNDO/REDO option is available, which makes every false move recoverable. Several graphical procedures make the manipulation of the atomic structures easier, while other graphical functions are suitable for checking the geometry of the structure. On the other hand, the traditional manual editing of the input scripts is more flexible, since it is not bound by the implementation of some specific GUI features. XCrySDen combines both approaches. It uses the easiness of GUI and the flexibility of manual editing. By this we mean that XCrySDen allows user to view and edit the input scripts for CRYSTAL programs on request. Immediately after the manual editing is completed the program visualizes the result. 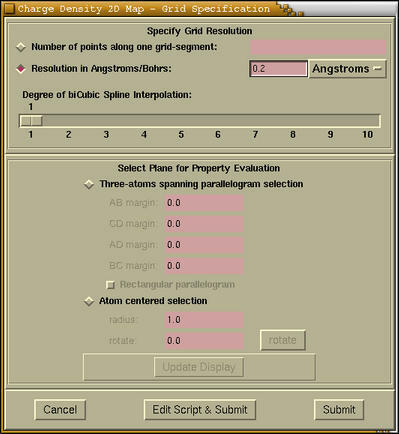 XCrySDen's GUI for CRYSTAL-95/98/03/06 program can be divided into two parts, namely: Structure Builder and Property analyzer. With XCrySDen a new structure (crystal, slab, polymer, molecule) can be built and saved as a CRYSTAL-95/98/03/06 input script (standard geometry input; refer to CRYSTAL-95/98/03/06 User's Manual). An existing input script can be opened and modified as well. A big advantage of XCrySDen is the immediate display of the structure. Some geometrical manipulations are not trivial at all and it is necessary to check them by means of visualization. Therefore several graphical procedures are available in order to simplify those manipulations. A new CRYSTAL-95/98/03/06 input script (only standard geometry input and geometry manipulation sections; refer to CRYSTAL-95/98/03/06 User's Manual) can be created by XCrySDen. 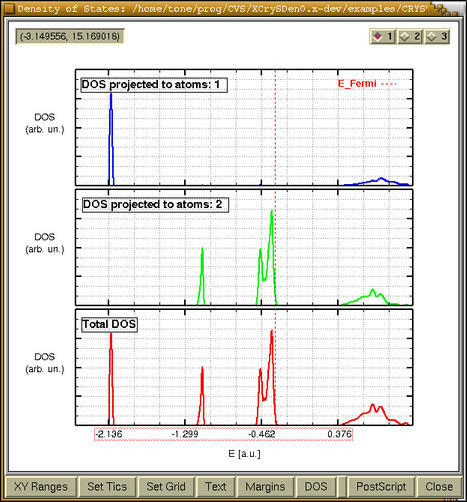 In order to do so launch the menu: File-->New CRYSTAL-95/98/03/06 Input Then GUI guides the user through specification of symmetry group, cell parameters (polymers, slabs, crystals) and non-equivalent atoms. Here is a full-snapshot of the whole process. An existing input script can be opened and modified via the menu: File-->Open CRYSTAL-95/98/03/06 Input . Two toplevel windows will pop-up. 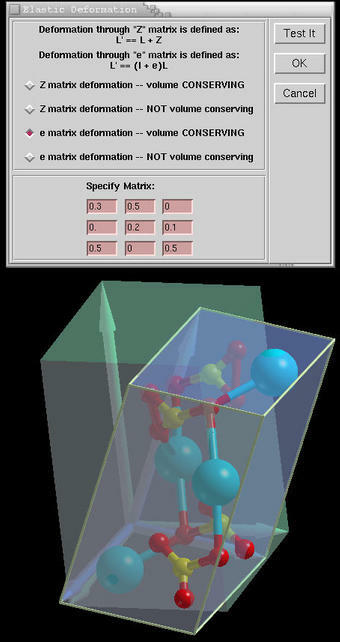 Right window (entitled Crystal Input: status) displays basic information about the structure (type of structure, symmetry group, cell parameters, non-equivalent atoms and the geometry manipulation keywords). 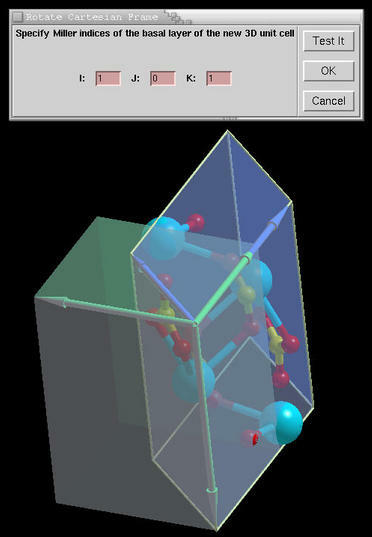 By pressing the left-side [View structure] button (where structure is either molecule, polymer, slab or crystal) on the Open Crystal Input window the structure will be rendered and both toplevel windows will disappear. By clicking the [Modify File] button, the Modify toplevel window will appear. This window has several buttons, and the records in standard geometry input section can be modified by clicking appropriate buttons. During this modification the basic information of the structure can be updated by pressing [Update Status] button on the ``Crystal Input: status'' window. At the end, when the editing of the standard geometry input section is completed the structure can be displayed by pressing the [View Structure] button on the Modify window. Once the structure is displayed, the user can specify additional advanced geometrical options via AdvGeom menu. 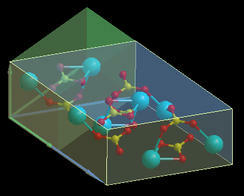 Via the AdvGeom menu it is possible to enter advanced geometrical options (refer to CRYSTAL-95/98/03/06 User Manual). This menu provides only a subset of all geometry manipulation keywords. Additionally, user can also specify extra options manually and view or edit the whole CRYSTAL input script on request. Important: there is an Undo/Redo mechanism for Advanced Geometrical Options options. These means that every option can be undone or redone. The Undo/Redo options are available under AdvGeom-->Undo and AdvGeom-->Redo cascade menus. An important graphical procedure common to many geometrical options supported by XCrySDen is selection process, where one either selects some atom or specific site. Tests the new setting of Cartesian frame. The new setting is displayed. The following stuff is rendered (only for Lighting-On display-mode): (i) atoms within the new unit cell, (ii) new unit cell with its lattice vectors in blue color, and (iii) old unit cell with its lattice vectors in green color. The new setting of Cartesian frame is loaded and stored. The Rotate Cartesian Frame window disappears. Warning: in order that the new setting of Miller indices of the basal layer takes the effect, the [Test It] button should be pressed prior to [OK] button. Cancels the process. The Rotate Cartesian Frame window disappears and old state (i.e. state before entering this option) is recovered. Atom & Cell Manipulation options are available under the AdvGeom-->Atoms & Cell Manipulation ... cascade menu. mouse-clicking the desired atom and pressing the [Selected] button on the Selection window. New atomic number can be specified by pressing [Periodic Table] button (Periodic Table of Elements appears). From the Periodic Table of Elements window one simply mouse-click the desired element. If user wants to substitute n atoms with KEEPSYMM flag and m atoms with BREAKSYM flag, then the substitution of atoms should be performed twice, once for n atoms with KEEPSYMM flag and once for m atoms with BREAKSYMM flag. Hole is a geometrical center of several atoms. To choose a hole first press a [Hole-Adding] radiobutton on the window, and then select appropriate atoms by mouse-clicking. When you are done with selection, press the [Selected] button on Selection window. When selecting the position with Cell-Adding procedure, the crystal vectors and current selected position are rendered. User must specify added position in fractional coordinates. By pressing [Update] button, the display of selected position (rendered as a spot at the top-end of the dashed cage) is updated. With Line-Adding the atom is put somewhere on the line between two selected atoms, which are selected by mouse-clicking. The selected position can be controlled by fraction of line-length from first selected atom. If user wants to add n atoms with KEEPSYMM flag and m atoms with BREAKSYM flag, then the insertion of atoms should be performed twice, once for n atoms with KEEPSYMM flag and once for m atoms with BREAKSYMM flag. Atomic label can be specified graphically by first pressing the [Select AtomSubs] button and then mouse clicking the appropriate atom. 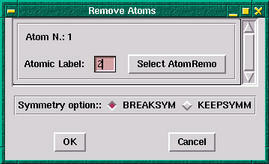 If user wants to remove n atoms with KEEPSYMM flag and m atoms with BREAKSYM flag, then the removal of atoms should be performed twice, once for n atoms with KEEPSYMM flag and once for m atoms with BREAKSYMM flag. If user wants to displace n atoms with KEEPSYMM flag and m atoms with BREAKSYM flag, then the displacement of atoms should be performed twice, once for n atoms with KEEPSYMM flag and once for m atoms with BREAKSYMM flag. Supercell can be generated via SuperCell sub-menu and specifying either expansion matrix ([Specify an Expansion Matrix] option) or unit-cell elongation factors ([Elongate Unit-Cell Vectors] option). For [Elongate Unit-Cell Vectors] option only three numbers (elongation factors) must be entered. A diagonal expansion matrix is then constructed automatically from elongation factors. To switch between [Specify an Expansion Matrix] and [Elongate Unit-Cell Vectors] options just press upper left or upper right button, respectively. The purpose of the [Test It] button is to produce feedback to the user, since it renders unit cell and supercell simultaneously. Unit cell is rendered in green, whereas supercell is rendered in blue color. The unit cell and supercell vectors are drawn as well. Warning: the [OK] button is disabled as long as the [Test It] button is not pressed. This simply means that one must press the [Test It] before the [OK] button. Before pressing the [OK] button, the [Test It] button should be pressed to register the latest expansion matrix. If user merely specify an expansion matrix and press the [OK] button without previously pressing the [Test It] button, the expansion matrix will not be loaded. Tests the new setting of Elastic Deformation. The new setting is displayed. The following stuff is rendered (only for Lighting-On display-mode): (i) new elastically deformed unit cell with its lattice vectors in blue color, and (iii) old unit cell with its lattice vectors in green color. The elastic deformation is loaded and stored. The Elastic Deformation window disappears. Warning: in order that the new setting of elastic deformation takes the effect, the [Test It] button should be pressed prior to [OK] button. Cancels the process. The Elastic Deformation window disappears and old state (i.e. state before entering this option) is recovered. For cutting a SLAB click AdvGeom-->Cut a SLAB menu. The Cut a Slab window will appear and all necessary parameters shall be entered. Miller indices can by either typed or selected interactively by means of mouse-clicking three atoms which lie on the appropriate plane. This is achieved via [Select the Plane] button, which launch the selection mode. For the explanation of the "label of surface layer" and the "number of layers" items refer to CRYSTAL-95/98/03/06 User's Manual. 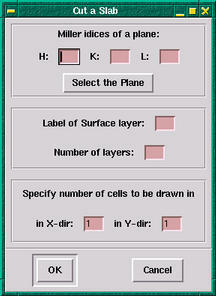 The "Specify number of cells to be drawn in" parameters stands for number of periodical images of the unit cell to be rendered in both crystallographic directions. These options are available under AdvGeom-->Cutting a non-periodical structure ... cascade-menu. So far, only Cut a Cluster option is available. Center of the cluster can be selected graphically. This is achieved by pressing the [Select the Coordinates] button, which launch the selection mode. Then one selects the center of the cluster by mouse-clicking several appropriate atoms. 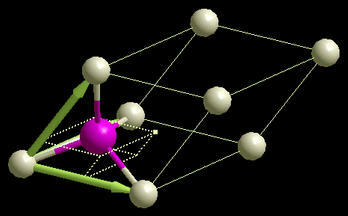 The position of the cluster-center is then calculated as geometrical center of selected atoms. If this option is selected, then user will have to specify radius of sphere inside which the nearest-neighbor analysis will be performed. 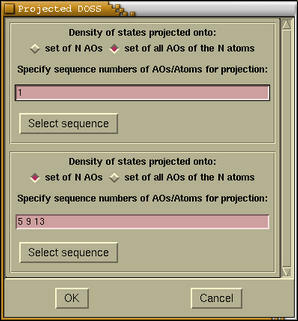 If this option is specified, user will have to specify user-defined coordination numbers for specified number of atoms. 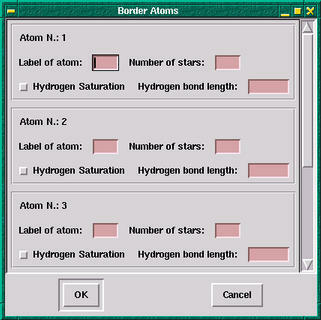 If this option is specified, user will have to specify the modification of border atoms. 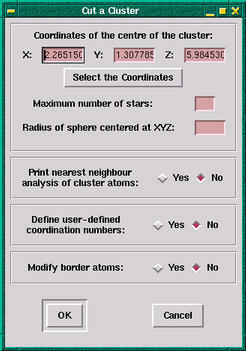 If the [Modify border atoms] option was not selected, the cluster will be displayed. If the [Modify border atoms] option was selected, then two windows will appear. Window #1:the first window displays the output generated by the CRYSTAL run. Window #2:on the second window two buttons are displayed. Here user can select how to modify the border atoms by clicking the appropriate button. When all data are inserted in the appropriate place, then by clicking the [OK] button on either Border Atoms or Modification of Border window the cluster will be finally rendered. An option can be also added manually. This possibility is available under Add an Option Manually menu. 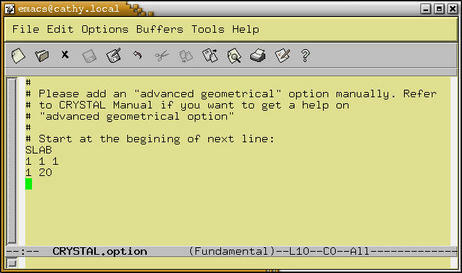 This option allows user to specify a geometrical option by typing it in an editor. Valid options are all the options as described in CRYSTAL95/98 User Manual, in the Section describing the advanced geometrical options. Editor is chosen on the basis of EDITOR environmental variable. If this variable does not exists, the vi editor is launched. Above we see an Emacs21 editor, where a SLAB option is added manually. The option follows the comment block (# character in the first line). This hash (#) lines are latter cropped out by XCrySDen. The comment is provide only for user-friendliness purposes, i.e. to tell to the user what to do. This option allows user to edit the whole CRYSTAL input script manually and to add/modify/delete the script arbitrarily in an editor. It is available under the Edit Manually menu. Editor is chosen on the basis of EDITOR environmental variable. If this variable does not exists, the vi editor is launched. This option is available under View Input Script menu and displays the whole CRYSTAL input script. This can be sometimes useful, especially if user is CRYSTAL beginner. Then she/he can see the syntax of CRYSTAL options. This option is available under Multi-Slab ... cascade menu. It is not a CRYSTAL option, but is meant to construct a multi-slab out of slab. The structure can then be saved in XSF format. The multi-slabs are the most common models of surfaces for plane-wave based codes. After we load our unit 9 into XCrySDen, the program displays the structure and the Properties menubutton gets activated. All properties options of XCrySDen are available under the properties menubutton. At the top of the NEWK Options window we can enter new NEWK values (refer to CRYSTAL95/98 User Manual for the explanation of the NEWK keyword). Below we can select whether we want to recompute the Fermi energy. Answer according to your needs. 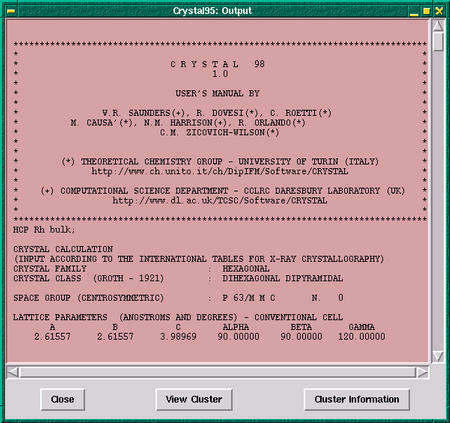 After pressing the [OK] button a new window appears, which holds a CRYSTAL output data. If we set the number of DOS projections (NPRO) to zero (default), then solely total DOS will be computed. 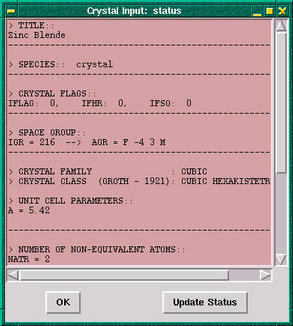 For the explanation of other parameters refer to CRYSTAL95/98 User Manual. When we input all parameters, then if the NPRO is zero the total DOS and another window holding CRYSTAL output appear. On the other hand, if the NPRO is greater then zero, then a new window appears. Here we enter the projection parameters for each projection. It is possible either to project the DOS to set of some atomic orbitals (AOs) or to set of all AOs for some group of atoms. This can be determining by choosing correct radiobutton. If we select the first possibility then we should enter the ID numbers of appropriate AOs. In CRYSTAL AOs are numbered in sequential fashion. To get an ID number for a particular AO we must know: (i) the order of atoms, (ii) the basis set, and (iii) how the shell are ordered in CRYSTAL (the order for p type shell is: x, y, z, while order for d type shell is: 2z2-x2-y2, xz, yz, x2-y2, xy; refer to CRYSTAL95/98 User Manual, p.50) Some information, such as number of AOs, and sequential order of atoms can be obtained by reading the output provided by Properties-->Get INFO menu option. If we press the [Select sequence] button, then a selection window appears. It merely displays the ID numbers of either AOs or atoms (depending on the prior choice of projection-type). Here we can select appropriate numbers by holding down the CTRL key and mouse-clicking. 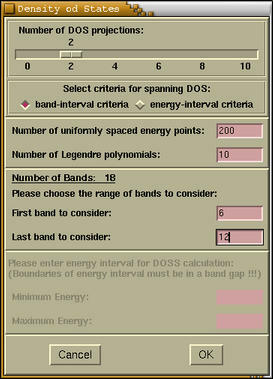 When we are done then after pressing the [OK] button the projected DOS (only if it was specified) and total DOS appear. Also another window holding the CRYSTAL output pops-up. Via [XY Ranges], [Set Tics], [Set Grid], [Text], [Margins] and [Dos] buttons one can refine the plot and make its appearance nicer. If one wants to change the font for labels or width/color of curves one can simple double click these items on the plot and a configuration window will pop-up. 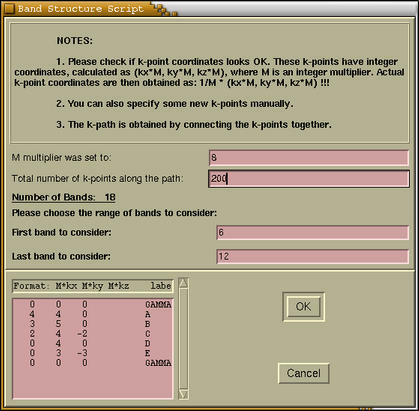 Band Structure (BAND) can be calculated and displayed via Band Structure menu. 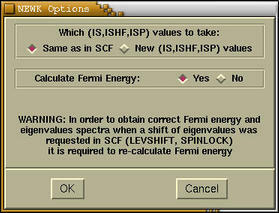 First the NEWK window pops-up, where one can select new NEWK values (refer to CRYSTAL95/98 User Manual for the explanation of the NEWK keyword) and requests for the recalculation of the Fermi energy. When we answer according to our needs a new window appears, where we select a k-path inside Brillouin zone (BZ). In above window we see two tabs entitled: (i) Primitive Brillouin Zone and (ii) Conventional Brillouin zone. The latter is provided only for informational purpose, namely, to see the shape of the BZ tessellated according to the conventional set of reciprocal vectors. 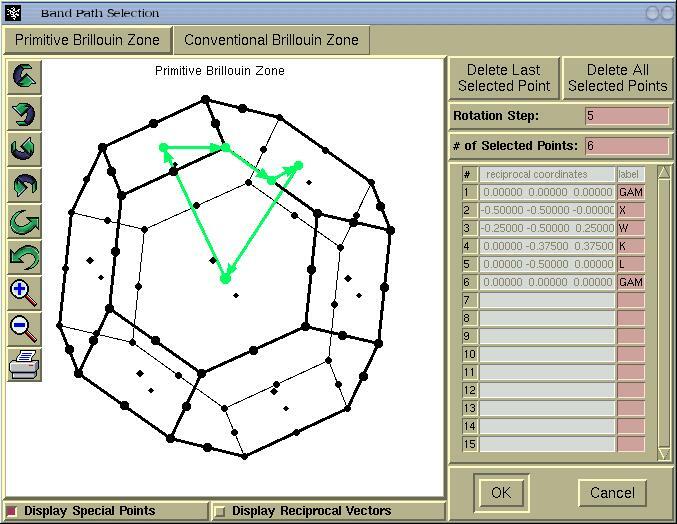 Hence for real applications we stick to Primitive Brillouin Zone and select a k-path by mouse-clicking a special k-points. The BZ can be rotated by holding-down left mouse button and dragging the mouse. When we are done with the k-points selection the [OK] button should be pressed and a new window will appear. Here we specify the BAND parameters. Also we can enter some additional k-points manually. 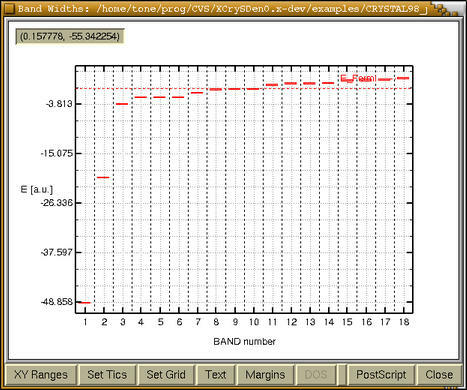 After pressing the [OK] button the band structure is calculated and displayed. Some properties like charge density and electrostatic potential can be represented in 2D or 3D fashion, as contour plots or isosurfaces. 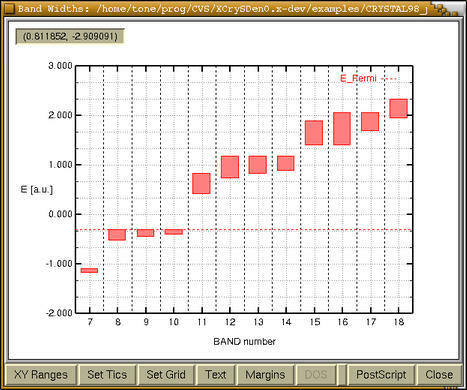 XCrySDen provides both kinds of plotting. Moreover for periodic structures this plots have periodic attribute, meaning that the plots can be replicated in periodic directions. BEWARE: it is suggested that only one 2D or 3D calculation is performed per XCrySDen run. For example, rendering first the charge density, and later on the electrostatic potentail might result in Segmentation Fault. Instead, run the XCrySDen twice. In first run render the density, and in the second run the potential. In order to produce an isosurface of some property (charge density, electrostatic potential) proceed via Properties-->Isosurfaces ... menu. There one can choose among: Charge Density , Electrostatic Potential and Difference Maps . There is a possibility of interpolating a grid by tri-cubic spline interpolation. At this stage I would suggest to specify no interpolation (degree=1), as it will be possible to do that later. Important: Only after we press the [Update button] the currently selected space will be rendered as transparent box. 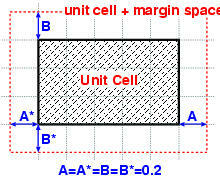 On the figure below we see the unit-cell space selection with the A=B=C=A*=B*=C*=0.2 margins. User will be able to modify the input script manually in an editor, just before it is submitted to calculation with CRYSTAL properties module. Via this options it is possible to alter the basis set, density matrix or some other tuning. For example: ...insert example.... Editor is chosen on the basis of EDITOR environmental variable. If this variable does not exists, the vi editor is launched. 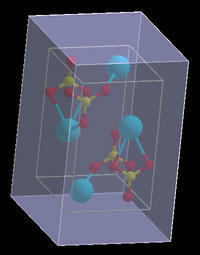 Submits the calculation to the CRYSTAL properties module. After CRYSTAL finishes calculating the 3D grid of points of specified property the Isosurface/Property-plane control window appears, where we can control various parameters of isosurface/property-plane rendering. The description of this window and its parameters can be found here. This window is divided in two parts: Map A and Map B. Later on, the difference plots will be obtained by subtracting the "Map B" from "Map A". For each map we should specify a few parameters, such as: property to be calculated (charge density, electrostatic potential) and some settings about the density matrix. There is a possibility to load the unit 9 from another file for the Map B (the [Load Crystal95's unit 9 from another file] checkbutton). For example if we want to render the charge deformation density (i.e. 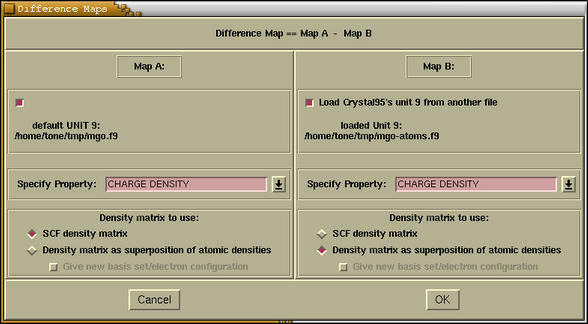 charge density difference between an SCF density and an atomic superposition densities) then in both maps we select CHARGE DENSITY property and an [SCF density matrix] radiobutton for Map A and [Density matrix as superposition of atomic densities] radiobutton for Map B. Here it is not possible to specify a new basis set for the atomic superposition density, but this will be possible later on, where we will be able to edit the CRYSTAL input script just before it is submitted to calculation. 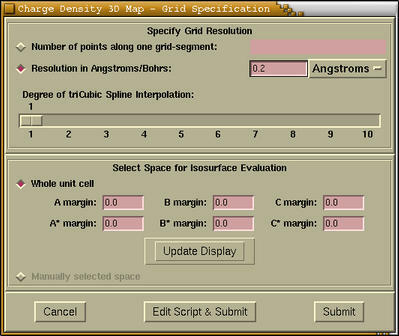 After pressing the information the 3D Map - Grid Specification window appear. Further information can be read here. In order to produce a contour or color-plane plot of some property (charge density, electrostatic potential) proceed via Properties-->Properties on Plane ... cascade menu. There one can choose among: Charge Density , Electrostatic Potential and Difference Maps . When we enter Charge Density or Electrostatic Potential option under the Properties-->Properties on Planes ... menu, then we first specify the grid parameters in the 2D Map - Grid Specification window that is shown below. The process is analogues to the 3D grid specification, with the exception that here we select a 2D region of space. 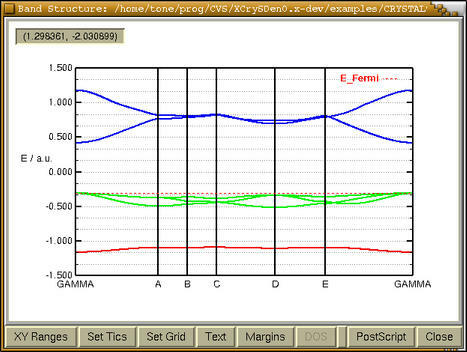 The hints for specifying the grid resolution can be found here. The second part (label Select Plane for Property Evaluation) of the 2D Map - Grid Specification window is devoted to the selection of 2D region of space. We can do that via two different procedures, which are chosen by pressing the corresponding radiobutton, that is either [Three-atoms spanning parallelogram selection] or [Atom centered selection]. After clicking this radiobutton a selection window pops-up. Here we select three atoms that lie on the desired plane. Then we press the [Selected] button on the selection window. After that we press the [Update display] button on the 2D Map - Grid Specification window the selected 2D region gets rendered as transparent parallelogram. We can also specify the margins AB, CD, AD, and BC. This margins are analogous to margins A, A*, B, B*, C, C* margins for the selection of 3D region. The updated margins will be rendered only if we press the [Update display] button. We have also a possibility to force the selected parallelogram to be rectangular. This is achieved by pressing [Rectangular parallelogram] checkbutton. On this window two buttons named [Select an atom center] and [Select a plane direction] stand for the two tasks that should be done. At the bottom of these buttons is either a "(to be done)" or "(done)" label. These remind us on the state of each task, namely, is the task already done or yet to be done. The selection window will pop-up when either one of these buttons is pressed. When pressing the [Select an atom center] button we should select one atom and press the [Selected] button on selection window. On the other hand when pressing the [Select a plane direction] we should select three atoms that define desired plane and press the [Selected] button on the selection window. When both tasks are completed we should press the [OK] button on the Atom centered selection window. Then we can press the [Update Display] button on the selection window to render the selected 2D region. Three button are located at the bottom of 2D Map - Grid Specification window. The description of their function can be found here. The process of creating 2D Difference Maps is analogous to the creation of 3D Difference Maps. First we specify the difference map parameters and then we select the 2D region of space, where the 2D difference map will be calculated.